Scratch Paper is a smart, supportive open mic for informative comedy, research-inspired storytelling, and charismatic talks, brought to you by Caveat. Sign up at the link! In the spirit of exploring “intelligent nightlife,” we’re hosting an open mic like no other. Researchers, teachers, and comedians will share the stage to hone their sets in a room that GETS IT. Are you a researcher or science writer who wants to work jokes into your upcoming piece? Are you a stand up comedian who wants to use history, science, or your other nerdy obsession to fuel your sets? 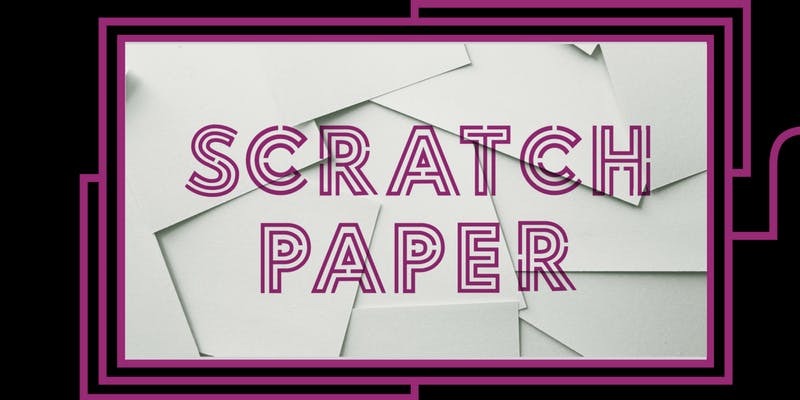 Whether it’s comedy based in research or research with a little something extra, Scratch Paper will help you test out new material that offers audiences exciting insights into the world… before the punchline. Sets will be kept to a strict 4 minutes limit. Sign ups open the Monday beforehand and are announced on our Facebook page. Missed the sign up window? We save room for drop-ins! To hear more about Scratch Paper, ask questions, and receive updates, join our community on Facebook. We’ll have old hands and new present, so no worries if it’s your first time! Even if you just want to come check it out from the audience, everyone will leave a little smarter (and a little drunker). Doors: 3:30pm Start time: 4:00pm Price: FREE 21+ Scratch Paper is hosted by…. Kate Downey is Caveat’s Creative Director. With a background in Shakespeare, Kate has directing and producing credits at New York City Opera, Cherry Lane, BAM and the Public Theater. After building renegade tours of the Metropolitan Museum of Art with Museum Hack, Kate fell in love with science and ran away with it. Carly Hoogendyk is a Producer at Caveat. She’s also a creative marketer and comedian – but she loves trees above all else. She is thrilled to explore the intersection of learning and being entertained. Shannon Palus is a science journalist whose work has appeared in Slate, Popular Science, The Atlantic, and many other places. She has a dog named Ada Lovelace. Kate Villa is a comedy writer and stand up comedian. She has worked in some of the most fun places (The President Show, UCBComedy, Pig Apple) and her writing has been featured in some of the most fun publications (McSweeneys, The Belladonna, Cartuna, Hellogiggles). She is, objectively, the most fun. Kyle Marian is a science communicator, former physical anthropologist, and dabbles in comedy. She works with Guerilla Science on top of producing The Symposium: Academic Stand-Up. A UK Bright Club Comedy alum, she is now on a mission to train up academics in stand-up & spread the smart funnies across the US.